The Rutgers boys beat the Columbia College Club at Tremont, N. Y., on Saturday in a game of foot-ball by a rather close score of 1 to 0. After a check of the gridiron football listings of the Rutgers and Columbia Universities, everyone can see both colleges agree on the tie score of 0 to 0 for that game. So this goal was not considered a real goal. Years ago the author contacted both college athletic departments and both agreed on the 0-0 score. A tie game was the better decision for Columbia, rather than a loss. The Rutgers Targum, in a Nov. 1872 issue, said the goal was kicked over the cross-bar because the field may have been set up for the “Tom Brown’s School Days” rugby game. A lengthy discussion followed in which the referee disallowed the goal because it became too dark. Checking contemporary newspapers of 1872 shows the game was actually played under some form of association football rules. 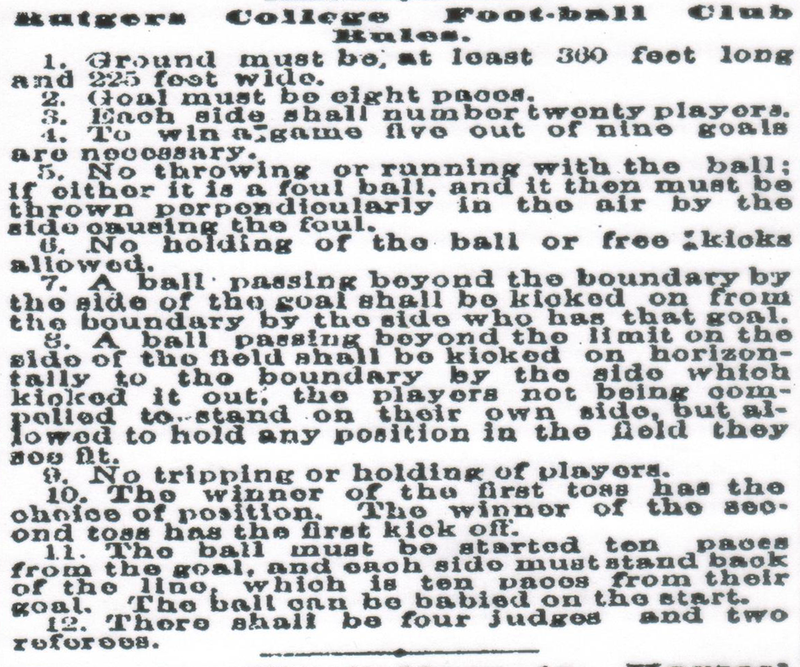 Trying to find some actual rules used that day has been difficult, but the Dec. 8, 1872 edition San Francisco Chronicle lists the “Rutgers College Foot-Ball Club Rules” on page 7. Rule number 2 states a goal must be 8 paces. Since a pace equals two steps, that makes it around 15 feet high. Rule 5 reads ‘no running with the ball’. Since both colleges now list this game under American gridiron football, the goal should have been accepted as a field goal under gridiron rules. However, the first passage of the gridiron football rules of three downs and a field covered with 5-yard parallel lines did not begin until 1882. Instead of using the accepted label of the game as a gridiron football game, the author has selected to use the contemporary newspapers’ classification as an association foot-ball game. A goal was scored under a cross-rope or cross-bar. There does not seem to be mention of any nets under the bars in the early 1870s. Now to look at the field where the Rutgers-Columbia game took place. At this time Columbia College was located at 49th Street on Manhattan Island. Tremont field was found in the West Bronx area of NYC above 160th Street. Looking north of Columbia College in 1872, there was a large concentration of Irish settlers everywhere. On Aug. 8, 1872, the national organization of Irish Clan-Na-Gaels got together to play Irish games including Irish caid foot-ball. There were 15,000 people in attendance at Jone’s Woods on 68th Street. There was also a heavy presence of Irish near the Tremont area of the Bronx at this time. Irish caid/gaelic foot-ball games usually had a net under the cross-bar for the ball to be kicked into for goals. The hands could be used to hit or bat the ball above the cross-bar to score points. Could it be possible the Tremont field was set up for an Irish caid/gaelic football game? Does anyone know when the net was first used under the cross-bar in the Irish game? A version of this article first appeared at Intercollegiate Football Researchers Association, Vol. 8, No. 10, October 2015. A retired meteorologist, Mel began to research American gridiron football around 1960 and soon realized there were many early soccer and rugby games mixed in with both the American and Canadian football historical games. Some 25-30 years researching soccer and rugby followed. Melvin, hate to leave a note here but need to reach our regarding a score listed in your book. I have been tracking down games played by my alma mater, Earlham College. Your book lists their first official game as a 10-0 win against Butler University in 1888. This is great, since we don’t win much these days. Problem is, I can’t find any corroborating evidence that this game ever took place. Butler even claims they didn’t play any games that year because of the presidential election. Really appreciate if you could point me to the source of this score.